Update 2:21:2007: I've added links to more hacks which solve issues discussed below. Update 9:22:2006: I've just gone through and updated the Agenda list to include Hacks and new updates to TypePad's software that resolve issues on the list. Out of 65 items currently on the list, 14 have links to Hacks or updates. There are a few others that I know can be fixed, but haven't published the hacks for yet. Definite progress… not even counting the other updates to the software that were not on the list before the design team implemented them! Update 3:20:2006: This entry is now the TypePad Hacks Agenda— New feature requests and suggestions from comments will be added here on an ongoing basis. Each has been edited to format it for the list, but includes author credit and a link to the original comment. A new post will announce changes whenever the list updates. Here's a list of the things I'd like to see changed in TypePad. Some are new features, some are issues that I feel would improve the existing interface, some are either bugs or oversights. This is the "master list" and I'll add to it as other bloggers make suggestions. I'm also going to devote a post to each of these, and why I feel they are important. For now, I just want to create an overview. If there's something that's really bugging you or that you've long wished to see implemented in TypePad, please let me know in the comments section. Some of these suggestions can currently be done in Advanced Templates or handled by third party solutions. Many of them should be should be integrated into TypePad's core functionality. It's also possible that some of the things I suggest can already be done in some way that I overlooked. Feel free to make corrections or suggestions in the comments. My favorite is (of course) at the very top of the list. TypePad Storefronts Shopping Template + Layouts. A compose window that creates a store layout with extended entries that serve as product pages. The catalog would be generated from a thumbnail image, title and pay pal button, not unlike a photoblog layout. The extended entry would contain descriptive text, full size photo and a pay pal button. Having a TypePad network of stores (just as TypePad.com has featured blogs and photoblogs) would bring more non-users to TypePad as potential customers. Using categories and tags to organize a dynamically generated store would be a powerful reason to come to TypePad as a host. This could be so frickin' huge… I'll be posting screen shots of proposed layouts and templates soon. Category archives for photo blogs. Being able to organize photos by category within one photoblog would be a powerful tool. Custom spelling dictionaries tied to user accounts. (It's silly that the spell check feature doesn't recognize the word "blog," for instance). printer-friendly page (if checked, this generates an icon in the footer linked to a text-only pop-up of the page. Just as "insert image" generates a thumbnail image with a pop-up that displays a larger picture. Email forms for blog authors. The current encryption used to encode email address in a standard Typelist can be easily read by using "get info" in FireFox. (Read this post to learn how to incorporate a secure email form for your typepad blog, with a free or paid account from freedback or response-o-matic). "Email this post" buttons for Basic and Plus accounts. (Create email this post links for Basic account TypePad blogs by using Feedburner's free FeedFlare service). Top level navigation bar, directly below the header. (To do this in Advanced Templates, use this Hack). Permanent intro post or homepage. (Create a killer landing page with a TypePad Plus or Pro account using this Hack. Or, refer to this post to learn about hosting HTML pages on TypePad and creating better "about" pages even in Basic TypePad accounts). (You can now pin a post to the top of your blog's home page by marking it as "featured." It's easy to do -- read how in the Knowledge Base article.). NEW: I would love to have the ability to make the title of a post link to the Permalink URL. Update: this is now a standard feature for TypePad. NEW: I would like to suggest the ability to add text ads (such as Adsense) between posts. (To do this in Advanced Templates, use this Hack kindly provided by Asha Dornfest. NEW: I'd like expandable excerpts, rather than entire posts, to show up in the archives. Clicking on a category or month in an older, active blog, brings up a very long page to scroll through. Drop down menus for categories and monthly archives can be created in Advanced Templates. This should be a standard Typelist option. A built-in, native search function would be a nice Typelist feature. The sidebar calendar should use scroll arrows to navigate between months. The "publish on" pop-up calendar in the blog compose widow has this feature. I would like to be able to make a TypeList that does not display a title, only the content. (To do this use this hack). NEW: Ability to change the order of Typelists on the "About" page. NEW: Sub categories in drop-down menus. NEW: I would like to be able to set a custom order for items in Typelists. (To do this, you can adapt the instructions in this hack). Although it is possible to create a comments feed in Advanced Templates, comment feeds should be a standard feature. When comments are set to require approval, a notice should be generated so that the commenter knows his comment has been sent and is awaiting approval. It should be possible to turn off TrackBacks or comments for all archived posts, rather than having to do this individually for each post. (To do this in a Basic or Plus account use this hack. In Advanced Templates, use this hack). (this is now possible by using bulk actions on posts, as desribed in this post). It should be possible to set comments and TrackBacks to be open for specified time period. IE: after one week, or one month, TrackBacks or comments are automatically closed. Most valid comments and TrackBacks appear when a post is fresh. NEW: I'd like an easy way to style the author's comments to make them stand out from reader comments. NEW: E-mail notification for readers leaving a comment on a post-by-post basis. (to alert them when others respond to their comment). NEW: Let TypeKey user's comments be automatically approved when comment moderation is enabled (as an option on each blog's configuration). c) give a warning on error code (404, 505, etc, etc) or timeout on publish, with option to re-attempt to republish. The current system just loses all the data when you click save if the service is down. Currently, if a blog is set to display oldest entries first, it shows posts in chronological order but displays only the most recent 10 (or however many entries the main index page is set to display). It should start with the first post, or this should be an option. The existing way pretty much guarantees that all readers will be dumped in the middle. The insert image feature should allow users to choose (or create) a directory for the image, rather than just dumping it into "Uncategorized Photos". This would make it easier to back blogs up, easier to find and replace images if needed and most importantly would prevent having to scroll through a directory of 1000's of loose files when searching for a specific image. There should be a way to back up image files as well as blog posts. "Uncategorized Photos" should not appear in the stats + referrers menu. It does not actually lead to any data, and is just takes up space for users with multiple blogs. When exporting a back-up file of a blog, it should be possible to break it into multiple files by category or month or post. The current export feature generates one long file. This runs the risk of eventually becoming too large on older blogs with many posts. Imagine trying to back up boing boing in one file! NEW: The ability to offer individual category feeds. Bud comments that category feeds are already do-able! (For instructions, read this article in the TypePad Knowledge Base). NEW: Method to create a single post and publish to multiple blogs (like a mini-blog-network). NEW: An import/export feature for template designs, similar to the import/export feature for posts. It should be possible to import either single templates or groups. NEW: The ability to have a "Next/Previous" or "More" link at the bottom of the main index page. NEW: A template that allows users to add a footer with various content to index pages. NEW: A backup/restore function for templates. NEW: I'd like to be able to select which photo albums and/or weblogs to post to when moblogging. It appears that TypePad allows only a single default location. NEW: I'd like to be able to more clearly separate authorship of multiple blogs under one account. I have two blogs under one account, but don't want them to share identifying features such as the author "nickname" or Amazon Associates ID in my Typepad profile. NEW: When you have junior authors assigned to your blog the admin should get an alert each time they post so that they know there is new content to be reviewed. NEW: More pinging options (perhaps add your own). NEW: A place to designate which feeds (even if they're Feedburner or some other service) to be used for auto-discovery (without using Advanced Templates). (Feedburner feed management has now been incorporated into the TypePad application as described here). NEW: The ability to manage Advanced Templates in an outside editor. Add text justification buttons to the "compose post" tool bar. It's the one word processing tool that I miss the most when doing blog entries, and really seems like a standard feature that should be included. It's silly to be able to click a button to style text as a bulleted or numbered list, but not be able to control justification on a paragraph level without going into the html. I use justification most often for photos, so, it could be included in the insert image dialogue, but would be more useful in the compose post window. The calendar interface used to select when an entry will be posted is awkward when scheduling entries more than a month or two into the past or future. It would be better to use drop down menus for day, month and year. Add a window for tags, similar to the TrackBack window. (Technorati Tags have been incorporated into the TypePad application as described here. Also see this update if you are using an older blog template. Stats should use a cookie to discount my own visits to my blog. Add an embedded real-time survey feature. (Read this post to learn how to incorporate embedded real-time surveys for your typepad blog, using MajikWidget). TypeKey allows multiple web addresses. It should also allow me to select the one I want to use as default. Although there are plenty of third party solutions for offline blog editors, I would really like to have a TypePad-native offline editor. NEW: On the page after sign-in, blogs are listed at the top in a blue box. If blogs were listed in order of most recently modified, my favorite blogs would always rise to the top. NEW: I would love to be able to choose the order blogs are listed on the "Your Weblogs" page by rating their importance to me, rather than by alphabetical order (or posting frequency). 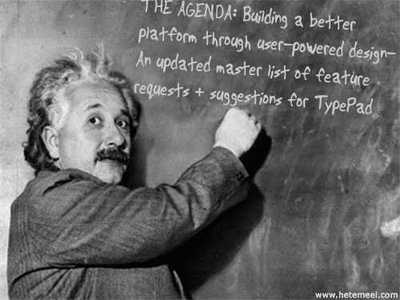 A TypePad equivalent of Robert Scoble who actively engages with the customer base and other bloggers. Archived posts at http://status.sixapart.com, so users can see the history of TypePad Service and what was done to rectify outages. This is crucial to transparency. Service outage posts should not be deleted when service is restored. TypePad should maintain a list of available third party solutions for stuff they don't want to take on personally. This could almost certainly be outsourced to a customer evangelist, but should be accessible from somewhere obvious within the knowledge base. There should be a way to purchase incremental bandwidth for bloggers who are between the TypePad Pro and TypePad business account. Was in mid-comment, when your second one came in. You are right I could have made the distinction clearer, so I went ahead with it. I think you'll find as you read that the posts and comments from me will all be positive, even when critical. I'm a big believer in diplomacy in blogging. Rants may work for link bait, but I don't think they are the way to establish trust or collaboration. Again, thanks for joining the discussion! Re; dropdown menus. Sub categories. I believe it's possible in Movable Type, why not Typepad? Sub categories… yeah, that would be *really* nice! I'll definitely add it to the list. 1) Tool to stream TypePad posts to a web site. John, I'm only going to speak for myself here, but I already find what you've written both immensely helpful and interesting. I do appreciate the tone you've taken and it's crystal clear to me that the spirit in which you are writing is one of a genuine love for the product and a desire to make it better. As you mentioned, all too often in blogging frustration clouds the sincere message of supportive desire and ends up sounding more like a scathing rebuke. Being that we *make* blog software, frankly, we're used to it. That is perhaps why it's such a nice and refreshing change when someone makes the effort to give criticism in such a constructive way. Anyhow, all of that is to say, keep doing what you're doing. It makes a difference. 1. I just posted an addition to the frequently asked questions page that provides you with, not one but TWO ways to stream TypePad posts to a web site. Check there. I'll add that to the list in a modified version… how about if you were able to choose which order they appeared in? I would love to be able to control which are at the top of the list (behind the default blog) but I'm not sure I would want it to be based on how frequently I post. Also, I suspect it would much less of a load on the server to provide the ability to number the order of blogs than by recalculating their importance based on posting frequency. You got my eyes all watery there for a second… really. Can I quote you in the sidebar on what you said? John, it *all* works for me. Thank you! I think that working in cordial creative tension with Jay and 6A, you may become the imbodiment of that old Marine Corps saying that if a task is difficult, we'll accomplish it today, and if the task is impossible, it will take us just a little bit longer. You know, I'm looking back at the comments today and mine are full of horrendous spelling errors! Add "spell check for comments" to the list! You've got me pegged, man… there's nothing I like so much as trying to accomplish impossible tasks! I think *these* tasks are all pretty doable, actually, but I'm a big fan of the non-trivial problem. How about subcategories? I seriously wish Typepad offered multiple levels of categorization. I've come up with my own solution at raleighing.com but it is annoying to have to do it manually. Also, I would like to be able to set a custom order for items in individual Typelists. I am using a hack to get around this but it should be something that is offered standard. Ooo, and I'd like an easy way to make the author's comments stand out from normal comments. That way people know right away that the response is from the author. There's probably a way to fake this, but I haven't figured it out yet. I took a look at raleighing.com… When you say multiple levels of categorization, do you mean the separate menus you've used (by area, by topic, etc)? I'm not sure if there is a good way to make that easier, but I'll run it by the TypePad design team and see what they think. Making author's comments stand out is a good suggestion. I'll add it to the list in the next round. John, here's a great-sounding hack for #3 in the Comments + Trackbacks section above ("it should be possible to turn off trackbacks or comments for all archived posts, rather than having to do this individually for each post"). If you have access to the blog template (meaning, a Pro account), it's not a bad workaround to delete the tag(s) that enable the comment area and trackbacks in posts. That way, you'd be able to disable comments/trackbacks in historical posts in one fell swoop. Of course, it would disable comment/trackback functionality on *every* post, past, present and future. So a bit of a compromise. Suggested by Craig McGinty in a comment to a post of mine today about combating blog spam. Re: comments. Yeah, the conversations feed is for comments but it isn't perfect. I've had a couple bug reports on it and am working on finding a better feed solution for them. I'll repost new instructions when I get them working bettter and update the feed as well. The comments feed as is *seems* to work in most readers, but doesn't handle dates properly, so the comments are grouped by the post the belong to but in the wrong order. I'll try and get started on that today. Look into using either co.mments.com or co.comments.com if you'd like to be able to track comments on a blog. That's what I use anytime I post a response that I'd like to keep track of. I also offer a co.mments.com button on my posts on www.raleighing.com to assist readers in adding the posts to the comments tracker. where each item is clickable, including the top level categories (Area and Topic). Hope this makes more sense of it. SixApart should definitely know what we're talking about since they implemented it in MT. I'm *not* much of a CSS pro, but do you think it might be possible to implement that look using styles? Personally, I'd kind of love to have the kind that "self-expand" where you click a link, and then it expands the menu to the next subset of categories… But i think i've only seen that on sites built on a php platform. Robert, I agree. Especially because I frequently modify post dates. This item is already listed above, (No. 3 under "User Interface issues" but it doesn't hurt to have more people weigh in in favor of the changes they'd like to see! I'd like expandable excerpts, rather than entire posts, to show up in the archives. Clicking on a category or month in an older, active blog, brings up a VERY long page to scroll through. What reader wants to bother with that? It really dilutes the power and usefulness of archived posts. That's a good idea and I *think* I might be able to figure out how to do it as a hack for advanced template users… But it would be a very nice option to have available in the design wizard. It's possible to set RSS feeds to show just an excerpt, so it must be possible to do the same on the blog itself. I'll add it to the list above. Love this blog and I will post about it soon on mine as well as on Netsquared. Many thanks and congrats. Agree with all of the requests. Number one for me is subcategories. Also especially interested in intro posts and sticky posts. And the idea of importing/exporting templates is brilliant (can't write importing/exporting without thinking of George Costanza). Wow! Super list of "must haves!" Typepad Hacks is on my DAILY reading list. Two remarks: (1) How come and Typepad, with such a throng of users, does not have a user forum where we can grapple with all these questions as above? and (2) social bookmarking is becoming a must; how about a native Typepad capability to add links to social bookmarking services in the footer of each entry? As a nontechie, I have struggled with this for a month or so and, every time, I have killed my Advanced Templates so bad I had to start afresh with a new theme/template from the standard Typepad collection in order for my blog to resolve correctly again... Any pointers to articles, advice etc on how to add such social bookmarking links to the footer of each entry would be appreciated... Keep on blogging, people!